The H2S/Sulphide-standard solution is generated in a coulometric cell containing a diaphragm by cathodic reduction of the electrode material. The concentration is infinitely variable by the variation of the generation current and/or flow rate of the acidic carrier solution. 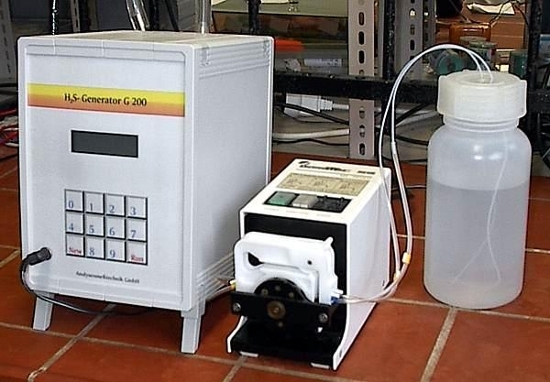 The generator is available in two versions - as microprocessor controlled device with integrated degassing device and as low cost analogue version without degassing device. For the stepless online calibration of O2 sensors. With integrated degassing device - convenient and accurate. Up to now oxygen sensors usually have been calibrated by the conventional two-point calibration with oxygen free solutions (e.g. Na2SO3) and air. This sometimes causes problems with accuracy. 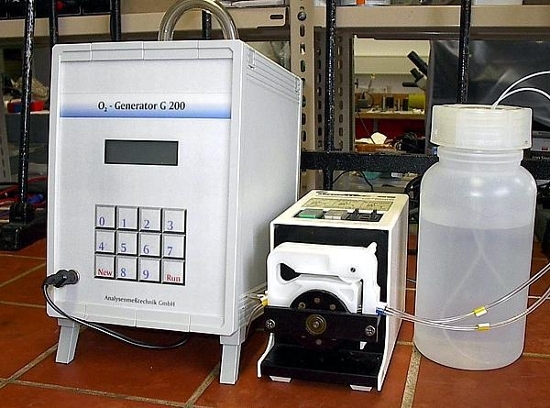 This disadvantage may be avoided, if the electro-chemical oxygen generator is used for the determination of the sensor slope of an oxygen sensor. Well-defined oxygen standard solutions will be obtained, if oxygen standard solutions are produced continuously by the electrolysis of 0,1 M NaOH in a flow through system. The oxygen concentration is step less adjustable and depends only on the electrolysis current and on the flow rate of the solution. So it is possible to calibrate sensors with as many measuring values as desired. The oxygen generator includes a degassing device which allows it to remove the oxygen normally present in solutions down to very small residue concentrations.